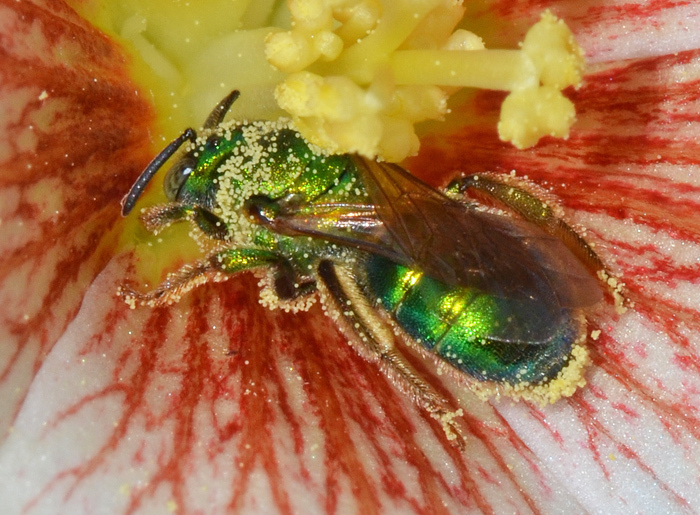 Hard to believe that an expert on bugguide.net could identify this sweat bee for me. The flower is from a tung oil tree Vernicia fordii which are common in our neighborhood. In 1905 the Dept. of Agriculture introduced the tree in Florida and other Gulf states. Later the flourishing American tung oil industry was wiped out by frost and hurricanes and the plantations never recovered. Today the tree is listed as an invasive species. Unfortunately they are also very poisonous and can cause rash.